UNIQUE DESIGN - Unisex, simple and elegant design with Japanese Quartz Movement. Display time with LED lights. Adjustable leather band made to fit most wrist sizes. EASY TO USE - To display time: simply touch the center of the watch with finger tip and the LED lights will flash, white for hours, blue for minutes; To adjust time: - touch the center of the watch 8 times, on the 9th time hold it for at least 3 seconds, when white LED light starts flashing quickly, hold it again to adjust the hour, then wait till blue LED lights start flashing, hold it again to adjust minutes. COMFORTABLE WEAR - Made of stainless steel, alloy, and premium quality PU leather. Light weight for comfortable wear. Want to take your sense of style to the next level? 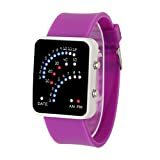 This unique eye catching touch screen LED watch that displays time with LED lights is guaranteed to be a talking point wherever you go. The simple yet elegant look makes it an ideal gift for your loved ones for any occasions such as Christmas, birthdays, anniversaries, father's day, mother's day, graduations, Valentine's day, etc, or when you simply want to spoil yourself with something new and trendy. 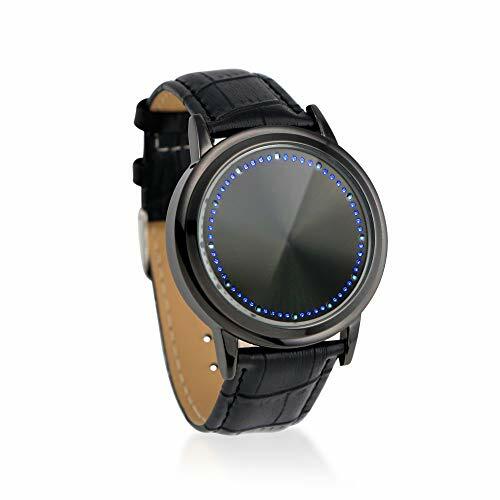 Made of stainless steel, alloy, and premium quality leather, this watch is light weight for comfortable wear, and fits most wrist sizes. Display and Adjustment Instructions: To display time - simply touch the center of the watch with finger tip and the LED lights will flash, white for hours, blue for minutes; To adjust time - touch the center of the watch 8 times, on the 9th time hold it for at least 3 seconds, when white LED light starts flashing quickly, hold it again to adjust the hour, then wait till blue LED lights start flashing, hold it again to adjust minutes.